No city on earth can match London on a cloudless night. Those perfect evenings may be few and far between in the foggy metropolis, but, when everything aligns, the beautiful midnight blue sky, the bright lights of the old city streets, and the even brighter lights of the stars overhead combine to create a special atmosphere. The London Blue Topaz Night Sky Ring was inspired by one special midnight blue night. 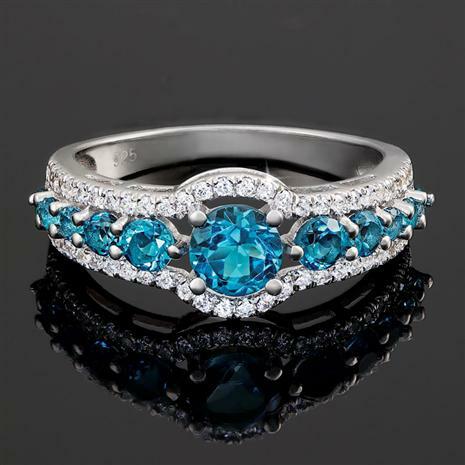 A sterling silver ring set with 11 London blue topaz rounds, the richest, deepest shade of blue topaz, captures the romance of the city. The London blue topaz stones are surrounded by 48 sparkling stars of lab-created DiamondAura®, bringing fire and brilliance to the night sky.